Instead of getting lectures from parents it is important to establish peer led groups/clubs stationed in schools to spread the message of distraction-free driving. Here it is 2015, and here is a distracted driving crash, an irresponsible act by a driver cutting short two precious lives. 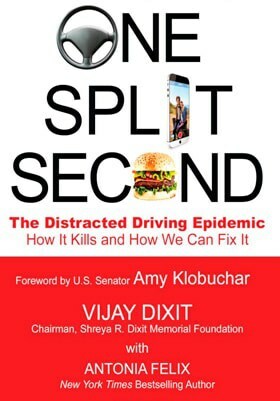 The Shreya R. Dixit Memorial Foundation set up the first group of Distraction-free Driving Clubs at three Minnesota high schools at the beginning of the 2015-16 school year. Performing surgery and controlling distracted driving–are they the same? My apprehensive friends deserve a clear and compelling explanation as to why I think that the similarity makes sense. The Institute of Advanced Motorists in Britain conducted research to study distracted driving behavior practices on British roads. Parents! Are You Endangering Your Teen Driver? This week’s column builds on a story narrated by my friend Jennifer from Texas. Jennifer drove all the way from San Antonio, Texas to Eden Prairie, Minnesota just to attend our 7th Raksha Walk for Distraction-free Driving on August 2. By the way, I never met her before. Now, I call her a friend for life. Not a day goes by without a newspaper or TV story announcing a fatality and/or injury caused by distracted driving. It is heartbreaking to see innocent lives lost due to an action that is easily avoidable. Our family was struck by a devastating tragedy and we resolved to find something good in it. One may term it strange, abnormal, weird, insane etc. etc. It is impossible for a family to lose a 19 year old child, in this case Shreya, and find something good in it? Why? I led the initiative to start the foundation in her name to combat distracted driving and felt like a higher calling pushing me from inside. Washington (Houston), we have a problem. Senator Klobuchar noted that states, including Minnesota and North Dakota were unable to qualify for much needed federal dollars allocated for distracted driving and teen safety in past years. AAA, the esteemed automobile club calls the period between Memorial Day and Labor Day, the “100 Deadliest Days” of summer. It is fair to assume that distracted driving behaviors has contributed a good deal to the creation of this term. I remember my teen years when I often would find myself in situations where it was difficult to challenge the norm in the midst of peers. Sometimes it was to protect my ego, and other times to avoid hurting a dear friend. I would rather go with the flow and do things that were totally against my wish. The deadly battlefield device called Improvised Explosive Device (IED) has become part of our day-to-day vocabulary, thanks to the Iraq and Afghanistan wars. It struck me that distracted driving, a human behavior, somehow demonstrates traits of an IED, a physical object. The more I thought about it, the more convincing it got. Driver distractions originate from multiple sources that reside both inside and outside of the car. These distractions cannot be managed through a single solution or tool. We need a multipronged approach to influence how we drive. I see the evolution of this approach already taking place on three fronts, namely: Technology, Legislation and Education. The state house and senate have passed bills which will require driver’s education classes in Rhode Island to include instruction and testing on the issue of distracted driving.